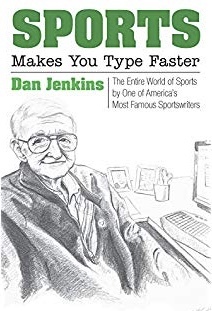 Sports Makes You Type Faster by Dan Jenkins—Here’s the other reason for my neglected fall desk duties: reading and laughing over Jenkins’ new book, published by his college alma mater, Texas Christian University (TCU) Press. It’s a rollicking collection of columns—“the vast majority are brand new,” writes Jenkins in the introduction—that covers the gamut of major sports. True to form, Jenkins—a member of the World Golf Hall of Fame and one of only four writers to be so honored—uses wit, satire and humor to enlighten and entertain. In most of the pieces, in two pages or less, Jenkins uses a fictionalized persona to skewer various subjects. But he also includes some “fact-based” ones including a well-argued and carefully researched piece on why the 1942 Hale America National Open golf tournament should be officially recognized by the USGA as Ben Hogan’s fifth U.S. Open title. As the famed sportswriter O.B. Keeler was to Bobby Jones, so too is Jenkins to Hogan. Jenkins genuflects at the altar of Hogan, having cut his reporter’s teeth on covering the fellow Texan.